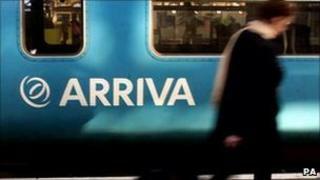 Drivers on Arriva Trains Wales are to strike on 27 December in a row over pay and conditions. The industrial action means that no Valleys Lines services will run on this date. Bob Crow, general secretary of The Rail Maritime and Transport (RMT) union, said 85% of members backed the industrial action and described Arriva Trains Wales pay offer as "paltry". Arriva Trains Wales has apologised for the inconvenience to passengers. The train operator said they planned to run a full service on all other routes on the network next Monday. Arriva Trains Wales said drivers had been offered a pay increase of 12% taking their basic pay from £34,824 to £39,117 in two stages. The offer also changed the obligation to work on Sundays from a voluntary to contractual basis, said the train operator. A spokesperson said: "Arriva Trains Wales is disappointed that RMT and its driver members have chosen to announce industrial action for Monday 27 December despite the significant pay offer which has been made. The spokesperson added that ATW train drivers were represented by two trade unions, ASLEF & RMT, and that ASLEF had recommended the latest pay offer to its members for acceptance. RMT general secretary Bob Crow said the offer would have left union members "out of pocket". "Our members would have ended up with inferior working conditions for a de facto pay cut. "That is why we have balloted for industrial action and why our members have delivered this overwhelming mandate," Mr Crow added. Last month a planned stoppage at Arriva Trains Wales by members of the drivers' union Aslef was called off.